TaskMerlin helps you quickly and easily store any kind of information. 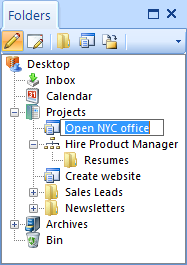 This information can then be organized into tasks, projects and folders in a few mouse clicks. As work is prioritized and assigned, all team members will see their respective tasks from their PCs. As work is completed, you will see status updates and newly created content. You can build powerful information filters to make sure you and your team are focusing on what needs to be done at the moment.